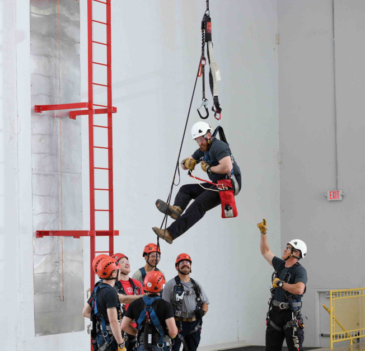 The Evacuation & Self-Rescue Training course concentrates on the various usages of the SRK-11® (ANSI certified Kit) or SRK-15® (CE certified Kit), Evacuation and Self-Rescue on wind turbines. Each student will learn to inspect and operate the dual-brake descender, as well as adjust the kit to his or her own body-weight in order to keep the kit event-ready in case of an emergency. Tech Safety Lines’ rescue training program meets or exceeds ANSI and OSHA standards for the wind industry.